Baking with a mix of flours and various types of natural sweeteners has become my new standard. I love trying different types of grains and nuts in flour form for breads, pancakes, and cookies, and all kinds of treats. So, it was a delight to see the newest book from the Kitchens of Martha Stewart, A New Way to Bake: Classic Recipes Updated with Better-for-You Ingredients from the Modern Pantry , that focuses on just that kind of baking. I recently received a review copy. Not all of the recipes are gluten free, but some are. And, not all of the sweet recipes are free of refined sugar, but less-refined organic sugar is recommended when granulated sugar is used. It’s a collection of mostly traditional, comforting recipes that have been amped up a bit in the nutrition department with a reduced use of white flour. The accompanying photo with every recipe will make you want to taste each one. At the very beginning of the book, I couldn’t wait to try the Gluten-Free Quinoa Pancakes sweetened only with maple syrup and the Vegan Banana-Oat Pancakes made with shredded coconut and orange juice. Still in the Breakfast chapter, I want to try the Double-Chocolate Rye Muffins, the Pumpkin Spelt Scones with Maple Glaze, and the Seeded Breakfast Rolls. Beyond breakfast, there are also cookies, brownies, pies, tarts, cobblers, cakes, breads, and more. I’ve marked many, many pages including the dairy-free Chocolate-Coconut Pie made with coconut oil and coconut milk, the Molasses-Oat Bread, and the Seeded English Muffins. So far, I’ve made two recipes from the book. I’ll be writing about the Cornmeal Drop Biscuits soon, and today I want to tell you about the Granola Cookies. They’re actually not made with granola. Instead, they’re made from a lot of the same things that go into granola. These are dairy-free cookies since no butter is used. Coconut oil was combined with brown sugar in the bowl of a stand mixer. I used less-refined muscovado sugar rather than regular brown sugar since I had some on hand. Eggs and vanilla were added next followed by flour and I used whole wheat pastry flour. Baking soda and salt were also added. 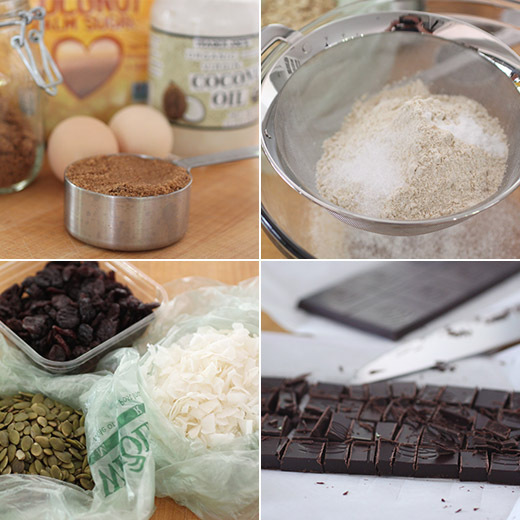 Last, oats, flaxseed meal, pumpkin seeds, large unsweetened coconut flakes, chopped dark chocolate, and unsweetened dried cherries were folded into the dough. Once mixed, the dough was refrigerated to firm up, and then it was scooped onto baking sheets and baked for about 14 minutes. This cookie checks every item on the desirability list: chewy, nutty, fruity, chocolaty, and delicious. And, there’s lots of room for personalization since you can use a different type of nut or seed, choose your favorite kind of chocolate, and pick a different dried fruit if you like. In fact, at the beginning of the book, there’s a suggestion to experiment with all of the recipes by trying different combinations of flours, milks, sweeteners, or fats. There’s even a handy chart and more ingredient info at the back of the book to help with making substitutions. Tinkering with and tasting all of these recipes is going to be fun. Recipe reprinted with publisher's permission from A New Way to Bake: Classic Recipes Updated with Better-for-You Ingredients from the Modern Pantry. Coconut oil takes the place of butter in this brown-sugar–based dough. Wholesome granola mix-ins—coconut flakes, dried cherries, pepitas—are added alongside bittersweet chocolate chunks for an irresistible old-fashioned drop cookie that’s a great energy-boosting snack. In a bowl, with an electric mixer, beat oil and brown sugar on medium until well combined, about 3 minutes. Beat in eggs and vanilla. Add flour, baking soda, and salt, and beat until combined. Stir in oats, flaxseed meal, pumpkin seeds, coconut, chocolate, and cherries until well combined. Refrigerate dough until firm, about 1 hour. Preheat oven to 350°F. Drop heaping tablespoons of dough, 2 inches apart, onto parchment-lined baking sheets. Bake, rotating sheets halfway through, until golden, 13 to 14 minutes. Transfer sheets to wire racks and let cookies cool completely. (Cookies can be kept in airtight containers at room temperature up to 2 days.) To make the cookie whole grain, swap in spelt flour for the all-purpose. To make gluten-free, substitute 1 cup of Wholesome Flour from Cup 4 Cup (available at cup4cup.com) for the all-purpose, and use gluten-free oats. Granola in cookie form...a real breakfast treat! I love baking with different flours and nuts too, these cookies look delicious Lisa! I hadn't made granola in forever and then made a big batch this weekend. The Mr was overjoyed at the snacking possibilities! 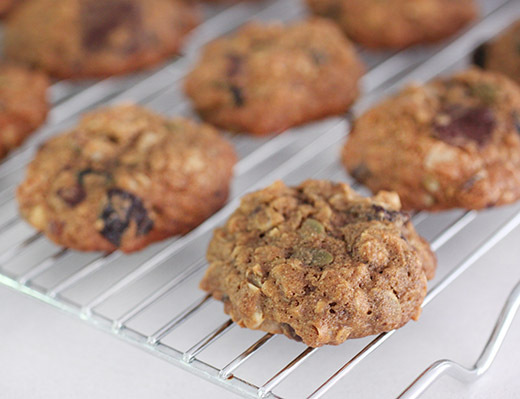 A big batch of these cookies would take his granola obsession to new heights! i haven't tried coconut oil in any cookies yet, but these look glorious! great snack! Sounds like an interesting book. Love to mix up my ingredients, and it sounds like this does a good job of it. Thanks! These cookies look awesome Lisa...with all the healthy ingredients...I love it! 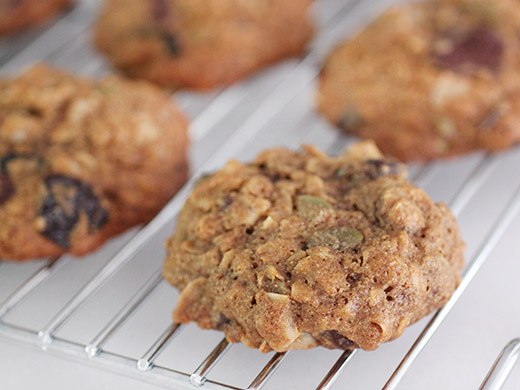 These cookies look really terrific with all the healthy ingredients loaded into them! Perfect for snacks or even some breakfast.